This past weekend didn’t go exactly how I imagined. I had a couple of shoots lined-up, but our little dude was fighting off a cold. Instead, we spent the weekend in bed, chatting about his birthday party themes and (thankfully) got this recipe written up. Talking about his party ideas made me realize that we’ve done 5 train related themes. 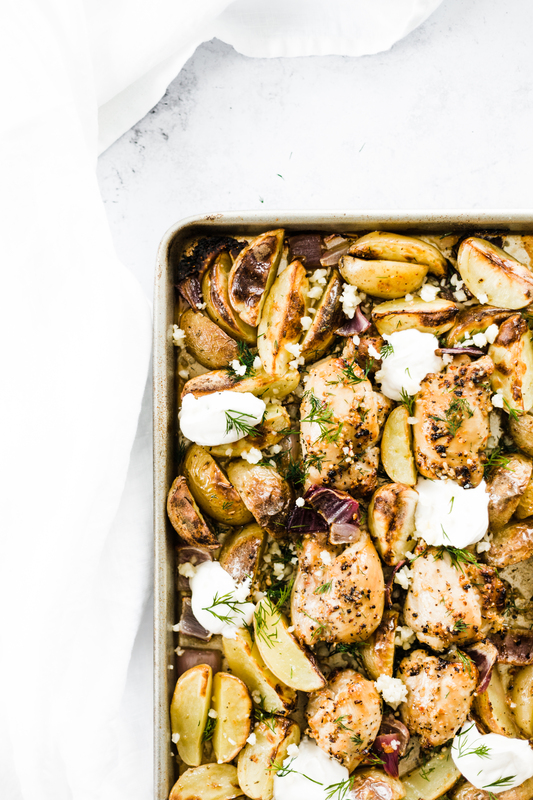 Ok, ok. Greek Sheet Pan Chicken and Potatoes…Let’s roll! I’d like to think that sheet pan dinners were created by super exhausted moms who needed to get sh*t done but wanted to provide a healthy meal instead of ordering takeout. Said dinner, would also be effortless and whipped up while running on auto-pilot. Please, don’t burst my bubble if my theory is incorrect. Let a girl live, ok? Well, I can confirm that this is exactly how this recipe came to be! It’s simple and has those delish greek flavours I love. Feta adds the perfect saltiness and Tzatziki with all its creamy, garlicky glory. 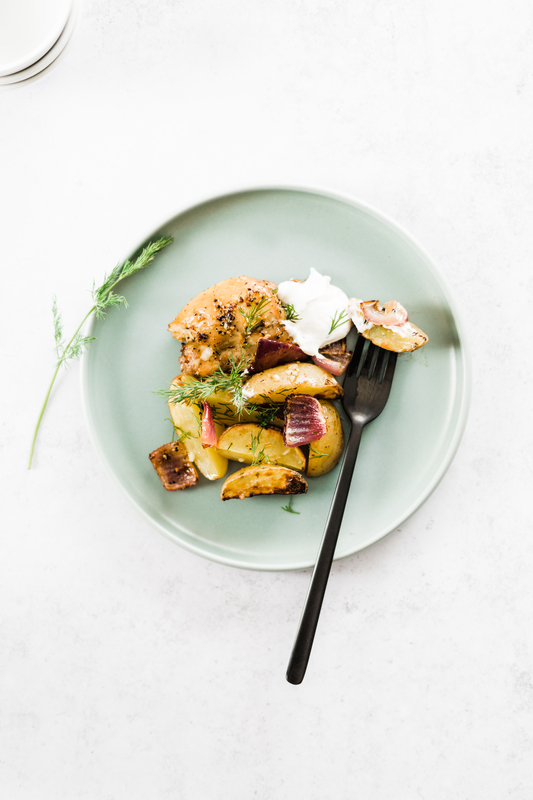 The buttery taste of potatoes along with the crunch and caramelization of the red onions. Juicy chicken packed with a punch of lemon and dill. Serve it with a quick tomato and red pepper salad, and you’re good to go. Shall I continue? I feel like I’m slaying the week with this one-pan dinner and it’s only Tuesday! Place the chicken in a large freezer bag and set aside. In a medium-sized bowl, combine olive oil, lemon juice, zest of 1 lemon, red wine vinegar, minced garlic, dried oregano, salt, and pepper. Pour into large freezer bag with chicken and marinate for 1 hour or up to 3 hours. Best when marinated overnight. 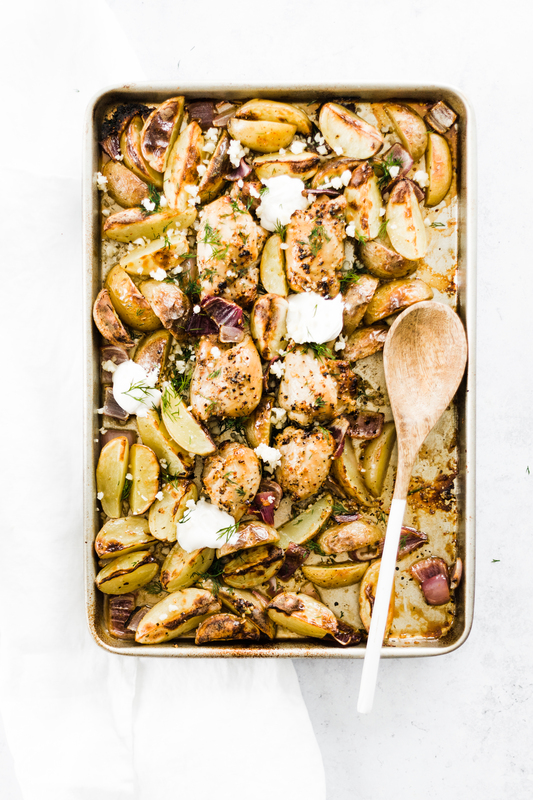 On a large sheet pan, add quartered potatoes and chopped onions. Drizzle olive oil and salt and peper to taste. Toss until well combined. Spread evenly and add chicken. Cook for 20-25 minutes, tossing halfway through until the chicken is cooked through and the potatoes golden. Serve with chopped fresh dill, crumbled feta and a heaping dollop of tzatziki. Cook time varies depending on oven and size of chicken thighs. Add red pepper, or any kind of vegetable to the dish. You can easily swap out ingredients and adjust cooking time as needed. Optional, broil on high heat for 2-3 minutes to crisp up potatoes. Store in air tight container in the fridge up to 3 days. 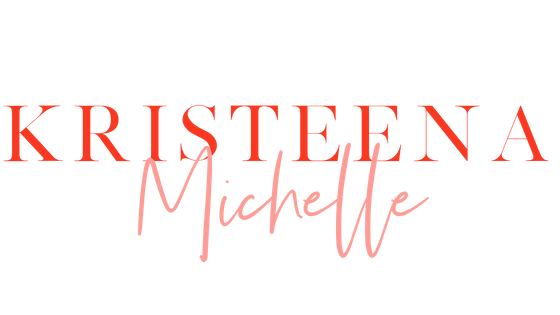 If you make this, let us see! Tag your photo with #KMyummyeats on Instagram.